No, they are not cactus covers…. I’ve been wanting to try knitting some mittens to practice for xmas gifts (our relatives have everything, so what am I supposed to do? I have to make presents). 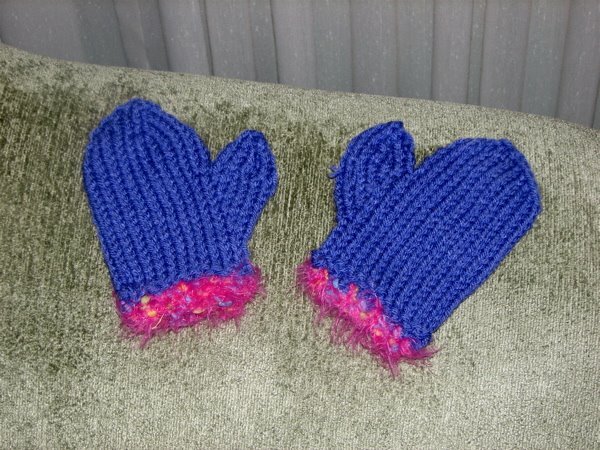 I decided to knit a pair for Amelia. She liked wearing them even when they were an “it.” She pinched her finger in a drawer yesterday and had to wear the Mommy Mitten to help the boo-boo feel better (aw!!). To be honest, I love my dh’s family, but some of them are very less-than-grateful for the handmade gifts. Seriously, if it weren’t for the little cutie, I would abstain from xmas altogether. Wah, wah, wah. Thankless relatives – how dreadful! I know how you feel about rude relatives… Unfortunately, I have been there too!